After hundreds of hours of planning and several simulated trips, 39 infants were moved to our new NICU on May 5. The GOJO Outpatient Surgery Center was the first to open with a patient family arriving at 6:30 a.m. The surgery team handled 10 surgeries on the inaugural day. The spacious new ER opened at 7:30 a.m., and handled about a dozen patients in the first 2 hours, including our first transport from Wadsworth EMS within 5 minutes of opening. At 8:15 a.m., special transport teams began moving 39 tiny babies 600 feet into their new homes in the Women’s Board of Children’s Hospital Neonatal Intensive Care Unit. We captured these historic milestone events throughout the day. We hope you enjoy. NOTE: Scroll over each image for a description. Click on the image to enlarge. The opening of Kay Jewelers Pavilion generated a lot of media attention as reporters captured the NICU move and first ER patients, including 8-month-old Anna. One of the advantages of our new surgery center is bedside registration in 1 of 8 private pre-operative rooms. Child life specialist Alisa Mills carries Pierson back to OR 3 for his ear tube surgery. Dr. Benson examines 2-year-old Declan, of Kent, before surgery as his dad holds hims. Dr. Mitchell, an anesthesiologist, answers questions from Pierson's mom, Erica, before surgery. Pierson is in good hands with the surgical nurses. The surgery team in our GOJO Outpatient Surgery Center performed 10 procedures on our inaugural day. A quick morning in and out of our new outpatient surgery center for Pierson and his parents. Dr. Sarah Berrine examines 8-year-old Kierra, one of the first patients in our new ER. 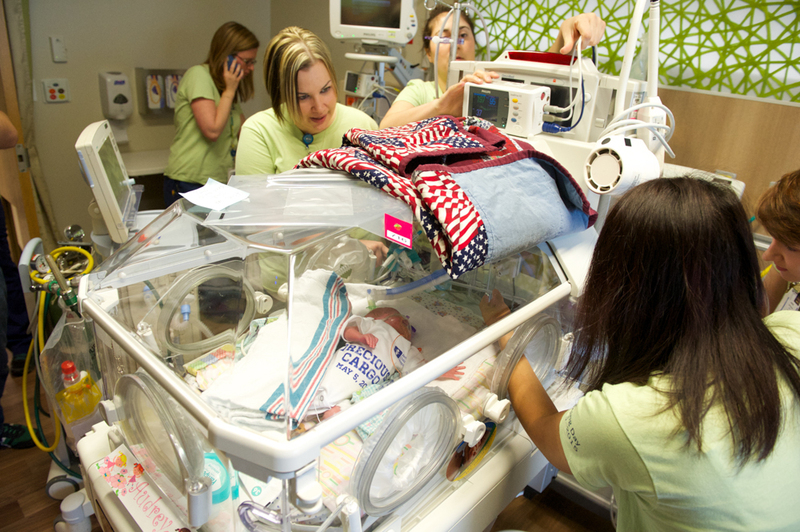 Each of the tiny babies wore matching onesies imprinted with "precious cargo" for their move into the new NICU. The private rooms of our new NICU aid in bonding, nursing and helping families have an understanding of what it will be like to care for their babies once they go home. The NICU babies ranged in age from 1 day to 13 months, with 11 weeks old being the average. They weren't supposed to be born yet, but 39 tiny babies took an amazing journey May 5 - just a few days before what will certainly be a memorable Mother's Day for their families. Loved ones followed the teams transported their little ones to their new rooms. It took about 8 hours to move all 39 babies from the old NICU to the new one. Most of the babies who moved into our new NICU were less than a week old. On move day, each baby received a full assessment by a range of clinicians to be approved for transfer. The move of 39 fragile babies into the new NICU required about 100 staff members from several departments. On this historic moving day, Dr. Anand Kantak, neonatology director, wears a "throwback" shirt from the opening of the hospital's Centennial Building in 1993. Kay comforts her son, Declan, before his surgery. Kate holds Luca while he's examined before his eye surgery. 8-year-old Kierra, of Akron, was one of the first patients of our new ER, which is twice as large as the old one. Dr. Milo and a surgery nurse check the new electronic patient status board before beginning surgery. Grandma bounces Luca on her knee in a private pre-op room. Mom, Kate, carries Luca into the pre-op area after checking in at the registration desk. After his ear tube surgery, Pierson sleeps in the comfort of his mother's arms in a private recovery room in our new GOJO Outpatient Surgery Center. With a history of ear infections, 13-month-old Pierson received ear tubes from Dr. Albert in our new GOJO Outpatient Surgery Center. As the first patient family in our new GOJO Outpatient Surgery Center, Erica Spice, of Copley, kisses and comforts her 13-month-old son, Pierson in a private pre-op room. Pierson is a brave boy as he waits for surgery in our GOJO Outpatient Surgery Center. Medical assistant Katee Seals gives the first patient of our new outpatient surgery center an ID bracelet. Child life specialist Alisa Mills lets Declan cruise around the pre-op unit with his mom, Erica, by his side. 11-month-old Luca, of Vienna, hangs with his grandma and mom, Kate, in a pre-op room before his eye surgery. Pierson's dad, Nathan, comforts him before surgery. Kate and Luca, of Vienna, await his eye surgery in our new GOJO Outpatient Surgery Center. Nurse shows Pierson the OR before they enter. Dr. Milo meets with Declan and his mom, Kay, before his surgery. Declan was the very first patient to go back to an OR. Pierson snuggles with his mommy in a private pre-op room before his ear tube surgery.